Today, we will begin (inshaa Allaah), a new book – an explanation of the greatest of all fundamentals of Islaam, and that is the fundamental of Tawheed. The belief in the oneness of Allaah, and to worship Allaah alone without any partners, its fundamentals, its principles, those things that if a person was not to know or to be ignorant of and turn away from, then that person is either deficient in Islam or completely outside the fold of Islaam. Deficient in his Tawheed or completely out of the fold of Islaam due to the fact that he has not upheld Tawheed or the monotheistic belief in the worship of Allaah. So we began by praising Him, seeking His aid and His assistance and seeking forgiveness from Allaah and knowing that it is Allaah Who guides, and whoever Allaah guides, there is none to misguide, and whomsoever Allaah misguides due to perversion in their hearts, then there is none to guide. I bear witness that there is nothing that has the right to be worshipped in truth except Allaah alone without any partners, and I bear witness that Muhammad (peace and blessings be upon him) is His slave and His messenger. Indeed the best speech is the speech of Allaah and the best of guidance and examples is the guidance and example of Muhammad (peace and blessings be upon him). The worst of all affairs are the newly introduced matters into the religion, every newly invented matter is a bid’ah, an innovation, and every innovation is misguidance and every misguidance leads to the Hellfire. The title of the book that has been authored by the great scholar, the ‘Allaamah Shaykh Ahmad bin Yahyaa an-Najmee (rahimahullaah) – this great scholar who passed away several years ago – delivered some duroos in explanation of Kitaab at-Tawheed which was later written, compiled, titled and published. It is called “Sharhul Moojaz al-Mumahhad li Tawheed Al-Khaaliq Al-Mumajjad Alladhi allafahu Shaykhul Islaam Muhammad”. So the book is entitled, ‘The concise and simple explanation of the Tawheed and Oneness of the Exalted Creator – which was authored by Shaykhul Islaam Muhammad’ – referring to Imaam Muhammad bin Abdul Wahhaab (rahimahullaah). Shaykhul-Islaam Muhammad bin Abdul Wahhaab is of course the author of this work: “Kitaab at-Tawheed”. So he begins by mentioning “Bismillaahi Rahmaanir Raheem, alhamdullilaahi Rabbil ‘aalameen”. After beginning in the name of Allaah, the Most Merciful, the Bestower of Mercy, and that all praises are due to our Lord, the Lord of the worlds. Then, may the salaah (that Allaah extols him in the highest company of Angels) and the salaam (safety and security from deficiency) be upon the most noble of the Prophets and Messengers, Muhammad and upon his family, upon all of his Companions. Tawheed is a principle of Islaam, upon which Islaam is built, it is the condition of its acceptance, by way of it, the good deeds are accepted and the evil deeds are forgiven, by it the servant enters into Jannah, and he is saved from the Hellfire. Due to it, the Messengers of God and the polytheists fell into disputes, and due to it, the swords of Jihaad clashed and due to it both Hellfire and Paradise were created. ‘And indeed, it has been revealed to you O Muhammad as it was revealed to those who came before you that if you were to join partners in worship with Allaah, then surely all of your deeds will be in vain and you will certainly be amongst the losers’. Due to shirk, the servant is forbidden from Paradise and he has his eternal residence in the Fire that is made obligatory upon him. For this reason, the concern and consideration for Tawheed is the most important of all affairs, the most obligatory of obligations and its abandonment, turning away from it and turning away from learning it is the greatest of all tribulations. So for this reason, it is binding upon each and every servant to study Tawheed and to study that which nullifies it, negates it or diminishes it and that which defames or vilifies it’s worth. From the best of that which has been authored on the subject is this book “Kitaab at-Tawheed” of Shaykhul Islaam Muhammad bin Abdil Wahhaab (rahimahullaah). By way of whom, Allaah revived the ‘aqeedah of Tawheed, Allaah revived the belief of Tawheed, in the region of Najd, which is in the present Kingdom of Saudi Arabia, in the 12th century after the Hijrah. He composed Kitaab at-Tawheed into sixty six chapters, it was further explained by some of his sons, his grandsons, his students and other than them. So some of the students of knowledge were eager for me to explain it to them, they were not satisfied with reading only the older explanations, rather they insisted that I dictate an explanation of it from myself so I sought the aid of Allaah, the Most High, and I started to dictate that which came to my mind, so they penned it down (my students). So it was presented to some of the mashaayikh who were eager to do good and eager to spread knowledge, for it to be transcribed onto a computer and when the first student was absent for a long time, then another proceeded with me in the same manner as the first one, and all praise is due to Allaah, for its completion. Before we can move on to the book, I think it would be the right place to mention an introduction, with regards to the life of the author, meaning the original author of the book Kitaab at-Tawheed and he is of-course Shaikhul-Islam Muhammad bin Abdul Wahhaab. He is from the most maligned and misunderstood luminaries and illustrious Imaams of Islaam. He is the enemy of every mubtadi’, innovator and deviant who wishes to turn away from the Tawheed of Allaah (subhaanahu wa ta’aala), whether he be from the shee’ah, from the sufiyyah, from the mu’tazilah, khawaarij and all of ahlul-bid’ah in general. This individual, Shaykhul-Islaam Muhammad bin Abdul Wahhaab is from the most hated by ahlul-bid’ah because of the fact that he upheld the truth and he stood for the haqq. He paid no attention to the blame of the blamers. And due to the propaganda of ahlul-bid’ah many of the general folk have an aversion to him, may Allah guide them. So we’ll begin with the era of the Shaykh Muhammad bin Abdul Wahhaab. 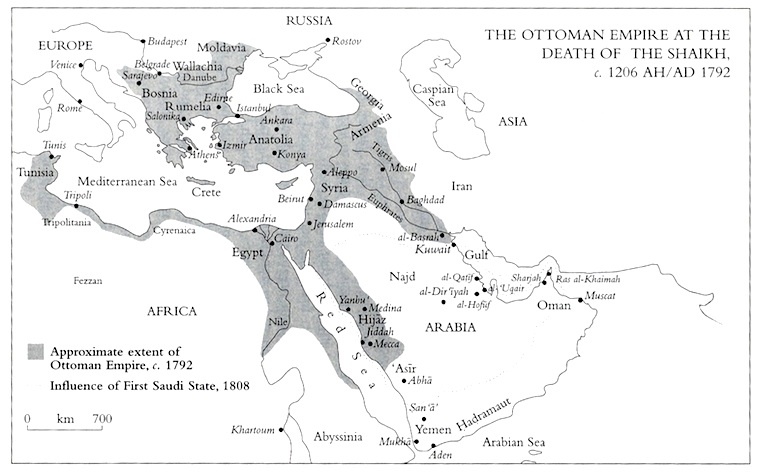 So I begin after seeking the aid of Allaah: The Turkish Ottoman Empire had pockets of sovereignty in the Arabian lands before the time of Shaykhul Islaam Muhammad bin Abdul Wahhaab – the Ottoman empire became little more than a hollow shell in Egypt, in Syria and in Iraq in the 18th Century, and dates are important! 18th century meaning the Gregorian calendar, the Christian era. 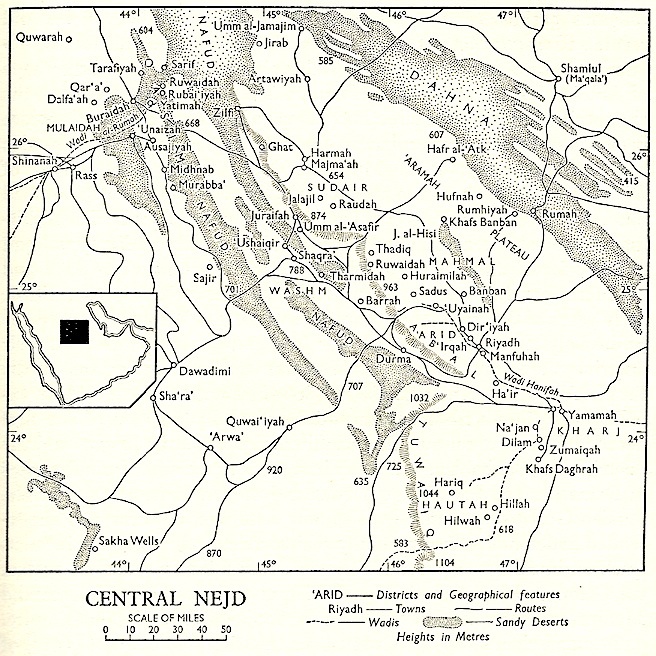 As for the Arabian Peninsula, then the ‘Uthmaaniyyah or the Ottomans never inhabited the vast areas of the Najd, the area where Muhammad bin Abdul Wahhaab was born and came from, and where his tribe came from, where his father came from and his grandfather came from – the Ottomans had never occupied that vast area. They controlled Baghdad and Basrah in Iraaq; but the closest they ever came to Najd, was in a place known as al-Ahsaa, in the year 1592 CE, which is a 1000 after the Hijra. They had a Turkish garrison at the village of al-Hufoof, however only 80 years later, meaning in the year close to 1100 AH, or 1600 CE, the Bedouin tribe of Banu Khaalid fell upon the Turks and expelled them, even from Hufoof. That’s the closest they ever came to Najd. The only place after that even recognised the rule in the Arabian Peninsula was the Hijaaz, Makkah and Medinah – and the Shareefs of Makkah looked to the Ottomans for protection. The Ottomans of course were based in Turkey with their rule centred in Istanbul and they had some control over the Hijaaz as protectorates. Political power in the Najd, and the Najd is on the eastern side of Madinah, if you were to look at a map of Arabian Peninsula, Makkah and Madinah, Madinah in particular, you would find Najd on the eastern side. As for Najd itself and its political power, then at the time of Shaykhul-Islaam Muhammad bin Abdul Wahhaab and the time before him it was broken into small territories for centuries. The Turks had never ventured that far inland, they had never even ventured as far as Najd. Why? Because there was no benefit for them, it was open desert where the Bedouins lived and the Bedouins used to fight each other over rulership over minute towns and villages. Ibn Bishr, who was the great historian of that area, a scholar of ahlus-Sunnah of the 19th Century CE, mentions the case of the tiny settlement known as at Tuwaym in Sudair. He states that in 1120 AH, there were four leaders all competing for the right to rule in that one little village, none of the four were individually strong enough to overcome his rivals, so they divided the town into four sections! Each one a king over his part! The domed mausoleum of Zayd ibn al-Khattaab, the brother of ‘Umar bin al Khattab (radiyallaahu anhu), was at Jubayl in Waadi Hanifah in the Najd. It was a famous shrine and many used to go there to seek intercession and aid from the grave of Zayd ibn al-Khattaab (rahimahullaah). In Dir’iyyah (near Riyadh), there were other tombs and shrines attributed to the companions of the Prophet (peace and blessings be upon him). People came from far and wide to visit them, and to seek aid and help from them, as has been mentioned by another historian Husayn ibn Ghannaam (rahimahullaah). He and others mention in the little village known as Fidaa, there was a male date palm tree and unmarried women seeking a husband would embrace the trunk and call out to it, ‘O male palm of the male palms, I seek a husband before I become barren’, and they used to come day and night, men and women seeking blessings from the tree. Ibn Ghannam also mentioned that the Tarfa’, or the Tamarind tree was a favourite place from which to hang pieces of clothing when a boy was born, believing that it would bring protection for the boy from the hand of death. Below Dir’iyyah, in Najd, there was a great cleft in the mountain, and a cave had been formed known as Ghaar bintul-Ameer, which they believed had been opened by Allaah in response to the cry for help uttered by a girl of noble birth when a man tried to attack her and take her honour. So then the people after that would visit the cave and leave meat and bread as offerings for whom they believed were the protectors of the cave. In Jeddah, which is of course to the west of Makkah, they had built a tomb that was 60 cubits long, in which they claimed was buried the wife of Prophet Aadam (alayhi salaam), the mother of mankind, it was 60 cubits long. It had 3 domes and the whole complex was 100 metres in length, it was 100 metres long and 4 metres broad and metre high. One dome was at the head, one dome at the navel and one dome at the feet. The tomb keepers amassed large amounts of money in admission fees for those visiting it. In Madinah, the city of the Prophet (sallallaahu alayhi wa sallam), people prostrated themselves before the grave of the Prophet, they would rub their cheeks in the dust and they would celebrate at the grave and they would seek aid from the Prophet (sallallaahu alayhi wa sallam), likewise at the graves of the companions. So this was the state of affairs, this was even before the birth of Shaykh al-Islaam Muhammad bin Abdul Wahhaab because the Shaykh was born in the year 1115 AH and he died in the year 1206 AH or in the western calendar, he was born in the year 1703 and he died in the year 1792 CE. Also, in the early 18th century, in the east of Madinah, there existed in that region the cult of the blind saint, a living blind saint of Kharaj in the south by the name Taaj bin Shamsaan. His devotees (in huge numbers) would seek his aid and they would sacrifice animals to him, the rulers feared him, and miraculous feats were attributed to him. They claimed that he travelled on his own through the whole distance from al Kharaj to Dir’iyyah which is near Riyaadh with no one to guide him except his own blindness. Hundreds of miles he walked with no one to guide him because they believed he had miraculous powers. So this is what the people were upon – that they would go and seek aid at the grave of Zayd ibn al-Khattab, they would embrace trees believing that the trees had miraculous powers, they would hang the garments of their children upon trees believing that they would bring blessings, they established a 100 metre long tomb in Jeddah, they would go to the grave of the Prophet (sallallaahu alayhi wa sallam) and rub their cheeks on the floor and prostrate to the grave and establish celebrations and rituals. And the Najd where Shaykh al-Islaam Muhammad bin Abdul Wahhaab (rahimahullaah) was born, that this was a place, politically speaking, which was scattered and divided, fighting each other. In one town! Four “kings” would fight and they would not come to an agreement and then they would divide it into quarters and split it between themselves. So it is a lie, a slander upon Muhammad bin Abdul Wahhab that he rebelled against the Ottoman Empire, it is a lie because the Ottoman Empire had no rule there. The closest they were was in Iraq, and they were not in the Najd where Shaykh al-Islaam Muhammad bin Abdul Wahhaab was born. As for the shaykh himself, then his father was Shaikh Abdul Wahhaab bin Sulaymaan. Firstly, that al-Wahhaab, it is a Name of Allaah (the Most High). So Shaikh Muhammad’s father’s name, meaning the father of the one that they hate, his name was ‘Abdul Wahhaab, meaning that he is the slave of The Bestower, because The Bestower is from the Names of Allaah. The name of the one who they want to attack, his name was Muhammad, the same name as the Prophet (sallAllaahu alayhi wa sallam) and they accuse those who follow Shaykh al Islaam Muhammad bin Abdul Wahhaab, those who take his teachings or read his books, they say to these people ‘You are Wahhaabi!’, ‘they are the wahhaabiyyeen’ or ‘they are the wahhaabiyyah’ and this is reviling Allaah because al-Wahhaab is a name of Allaah. Secondly, that they are ascribing a people to his father and ignoring him because his name was Muhammad, his name was not Abdul-Wahhaab. So his father was Abdul Wahhaab bin Sulaymaan, and he was a Hanbalee scholar and he was Qaadi of al-‘Uyaynah. Sulaymaan was the grandfather of Muhammad bin Abdul Wahhaab and he was also a Qaadi, and he was greater than even his father in scholarship and he was a scholar of fiqh in Najd, he was a jurist. So Muhammad bin Abdul Wahhaab was from the people of Bedouin descent from the tribe of Tameem. So his name was Muhammad bin Abdul Wahhaab bin Sulaymaan bin Ali bin Muhammad bin Ahmad at-Tameemi – that was the full name of the Shaykh. Muhammad bin Abdul Wahhaab also had a brother called Sulaymaan. Muhammad bin Abdul Wahhab was born and raised in the village of al–‘Uyaynah in Najd, under the control of who? Under the control of the local tribe who used to fight other tribes for the control of local townships. Not under the control of the Ottoman Empire. He memorised the Qur’aan by the age of ten, he then went on to study fiqh, tafseer and hadeeth. So much so that later his father would seek his opinion in fiqh and religion. He studied from his father, also from Ibraaheem bin Sulaymaan who was his uncle, also a scholar. So Muhammad bin Abdul Wahhab came from a family of Hanbalee scholars. His father found that his son had matured at the age of 12 and he was praying fully in congregation constantly from the age of 12 onwards, meaning by that age he had matured and he was praying fully in congregation, so he married him off at the age of 12. Then he sought permission from his father to perform Hajj. There he met the scholars and people from the various parts of the Islamic world. Then a while later, after returning back to the Najd, back to ‘Uyaynah, where his father was, he returned back and that was in his teens. Even before that, in his teens, he had started speaking against the innovations in ‘Uyaynah. So as a young man, he went to Hajj – he returned back and recognised, even at his age young that there were innovations and oppositions to the Qur’aan and Sunnah taking place in his own village. So he spoke against the innovations, some people listened to him but most turned away from him. So then again he travelled to Madinah after performing Hajj and then he met the scholars of Madinah and the ones that he studied extensively under Shaykh Abdullah bin Ibraheem ibn Sayf, who was originally from al-Majma’ah in Najd. He also studied under the scholar, Shaykh Muhammad Hayaat as-Sindee (rahimahullaah), who was a scholar of hadeeth, originally from Sind which is in modern day Pakistan. He saw many innovations that people were drowned in, around the Masjid an-Nabawee in Madinah. So he begins to see what the people are doing around the grave of the Prophet (sallallaahu alayhi wa sallam). So after graduating from these scholars and after seeing what he saw in Madinah, and learning from those scholars in Madinah – and seeing what was taking place around the grave of the Prophet (sallallaahu alayhi wa sallam) and the things that they were doing, the festivals that were taking place around the grave and the rituals: people calling upon the Prophet and rubbing their cheeks into the ground and making prostration in front of the grave. He realised that all of these were innovations and contradictions to the Sunnah. Then he travelled to Basrah in Iraq, because he heard that in Basrah, there were scholars of Sunnah, so he intended first to go to Basrah and then he decided that after Basrah, he would go to Shaam and study with the scholars of Shaam, which is modern day Syria. The scholars in Shaam were of the Hanbalee madhhab. In Basra, he studied under Shaykh Muhammad al-Majmoo’ee, who was a scholar of the ‘aqeedah and tawheed. In Basrah, he saw what the Shee’ah were doing, he saw the innovations of the Shee’ah, since the tomb of ‘Alee (radiyallahu ‘anhu), was at Najaf, and the tomb of al-Husayn the son of ‘Alee (radiyallaahu anhuma) was at Karbala and both of these places were close to Basrah. So it was not long before Shaykhul Islaam Muhammad bin Abdul Wahhaab (rahimahullaah) started speaking and calling to the path of Tawheed and Sunnah and the people started gathering around because he was strong in knowledge and he was strong in refuting innovations and he was eloquent in speech and he was highly intelligent. And the people started learning from him whilst he was still young in age. But at the same time, the enemies began to gather and they gathered against him and over time they plotted harm him and expel him from Basrah, this was their plan. That this man has come, studying under the scholars of Sunnah, in Basrah but he is spreading the truth in this town, so then they planned to harm him. So one day, they gathered upon him and they beat him, and they bruised him and they threw him out, and they took hold of his teacher and they likewise treated him with harshness and aggression. They threw Shaykhul Islaam Muhammad bin Abdul Wahhaab out of Basrah, barefoot without even being allowed to collect his belongings. So then he headed alone barefooted to the town of Zubayr in the south west. On the journey he became overcome by thirst because he had no provision with him, heat and fatigue overcame him and he nearly collapsed, up until someone found him and aided him and that generous soul placed him upon the back of his donkey and then took him to Zubayr. When he reached az-Zubayr, he recovered. From az-Zubayr, he decided that he was not going to stop, so then he went out and headed towards Shaam and he stopped on the way at Hufoof, as a guest of the Shaafi’ee scholar, Shaykh Abdullaah bin Abdul Lateef, and he studied with him for a while and then after studying with him, he wished to move on and head towards Syria. He finally decided upon the way, as he was travelling, to return back to Najd, because between Hufoof and Shaam came the region of Najd, so then he returned back home and had realised that his father had moved from ‘Uyaynah to another place in Najd known as Huraymilah. So Shaykhul Islaam bin Abdul Wahhaab, found his father there, when he reached Huraymilah. That is where he wrote his famous work Kitaab at Tawheed, and it is said that he wrote it when he had still not past his twenties. That very same book that you find scholars in their 80’s and 90’s still teaching. Most of the Shaykh’s works, you will realise have within them a great amount of influence from Shaykhul Islaam ibn Taymiyyah (rahimahullaah), who died within the year 728 after the Hijrah, and he died in the year 1206. All of the works of Shaykhul Islaam Muhammad bin Abdul Wahhaab, you’ll find in there a thread of the teachings, the methodology and the ‘aqeedah that was revived by Shaykhul Islaam ibn Taymiyyah five centuries earlier. So he wrote Kitaab at Tawheed whilst in Huraymilah. After his father’s death, rahimahullaah, he returned back to ‘Uyaynah, where the ruler ‘Uthmaan bin ‘Amr welcomed him and when Shaykhul Muhammad bin Abdul Wahhaab gave him da’wah, he accepted the da’wah. So that was the first of the rulers of Najd to accept the da’wah of Muhammad bin Abdil Wahhaab. So he started teaching in ‘Uyaynah, which was not far from Huraymilah. So after his father’s death, he went back to his birth town, ‘Uyaynah in the Najd. When he started teaching there, people started coming to him; he’s older, his knowledge has become stronger, his intellect is sharper, he’s able to refute with evidences and proofs, so people started listening to him and they started travelling to him from the various villages, and he was still in his twenties! Two further students joined him, now these two students are very important because these two students travelled from a town known as Dir’iyyah. One of them was named Thunayyan, and the other one was Mishaari. Why are these two names important? Because these two men were the brothers of the ruler of Dir’iyah. What was the name of the ruler of Dhir’iyyah? Muhammad ibn Sa’ood, after who’s family name, the Kingdom of Saudi Arabia is named, the House of Saud. Summarised transcript of the opening class of Kitaab at-Tawheed part 1 (May Allah reward the sister who transcribed it).